This past weekend, Dr. Daniel Matt was in town. For those who don't know, he is the leading Kabbalistic scholar. He is simply amazing at his ability to take such complicated concepts and bring them to the general population in a way that is understood, meaningful, and though-provoking. During my Shabbat downtime, I read an article written by Dr. Matt called "Loving G-d with the Evil Impulse." I have to say - wow. This is probably old news/teaching to all you people out in Bloggerland. For me, though...it was a new teaching. The article centered around a story in the Zohar (Zohar 2:162-163) about a King and his son. The story goes that the King wanted to test his son's devotion, so he hired a harlot to seduce him. In the course of the seduction, the son rejected the harlot. The question is posed: Who deserves the honor? The son for rejecting...? Or the harlot? After all, it was the harlot who (1) listened to the King in the first place, and (2) enabled the son to have the honor and praise he received from his father. Without the harlot, there would be no ability for the son to demonstrate his devotion. Therefore, the son should be grateful to the harlot for that opportunity. This thing that is being represented here is the yetzer ha-ra (evil impulse). While other religions tend to demonize this impulse as bad, Judaism seems to understand that in measured balance, it is the thing that compels us to even get a job and get married. A little selfishness is necessary to thrive, along with a little desire, passion, and ambition. It also recognizes that in its extreme, it offers an opportunity for us to make choices, and to overcome. For this, we should be grateful, and recognize that the yetzer ha-ra has a place in our world, and even a positive one at that. 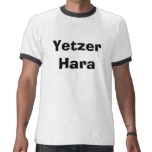 Dr. Matt says that some yetzer ha-ra must be rejected outright. However, if always suppressing without evaluation, it can cease to be piety and instead be neurosis. Other times, its energy can be channeled creatively into something virtuous. At the very least, we can appreciate the opportunity that it gave us. Dealing with our yetzer ha-ra is almost always challenging, but this new perspective of it being something for which I can and possibly should be grateful toward, puts a whole new spin on a variety of occurrences in my life. I pray this holiday season that I am able to wrestle appropriately with my yetzer ha-ra, use it to my advantage and the advantage of others, have a spirit of gratitude toward it, and channel and shape it into something that could possibly resemble wisdom down the road.